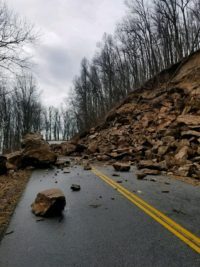 Part of the Blue Ridge Parkway locally may be closed due to a rock slide. Heavy rain caused some trees and rocks to slide along the parkway at Milepost 277 near the Stoney Fork Valley Overlook. Park officials on Monday were saying to expect possible closures in that area. For real time closures on the Parkway check this link.